So on my first real post on the blog, I decided to tackle not 1, not 2, but 3 (count 'em 3!) topics! Ninjas are everywhere. Ninjas are in movies, ninjas are on TV, there is probably a ninja clinging to the bottom of your desk right now. With their roots in the battlefields of 14th-century Japan, ninjas were assassins who practiced the art of ... oh, who cares? It doesn't matter where ninjas came from. All you need to know is that ninjas can totally kill you without even thinking about it. In fact, ninjas are so lethal that it takes an enormous effort of will for them not to kill you. You are only alive because a ninja is trying very hard not to shoot a blow dart through your neck right this minute. And finally, jetskis. So this is pretty much just for Peter, and, actually, I'm pretty sure he doesn't even know this blog exists right now, but I'll fix that right after I finish this post. 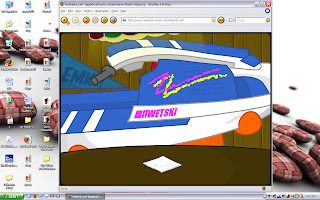 Anyway, I was checking out the latest HomestarRunner short and, lo and behold, there was a jetski! And not only a jetski, but to my untrained eyes it looks like a stand up! Maybe a superjet, but I'm leaning more towards a 550. Maybe a 450. 350? Here's a screenshot I took for proof. If you want, you can also check out the whole video (it's actually not too bad!). This morning I stopped for coffee at Anodyne on Brady Street. There was this nice...but somewhat strange man outside. He greeted me as I got out of my car. He recommended his favorite coffee drink. Then when I left he told me that I looked really nice. Then he asked me if I had to dress up every day because of my work. I was polite. I like it when people think I look nice. I'm pretty sure that guy was a ninja. Yep, I'm fairly certain. haha! You guys crack me up!!! April I am pretty sure if that guy was a ninja he would be dressed up in the ninja garb, and if he was dressed up in the ninja garb and you saw him I am pretty sure you would be dead. So its safe to assume that he was absolutely not a ninja. Dustin good eye. technically that was a wetski but I am sure thats to avoid copy right violation and that sort of thing. you would be correct in assuming that was a kawasaki jetski and not a yamaha waverunner. On top of that you are probably right on thinking it is a 550. it could also be a 440 or a 400 but the 550 is much more popular. oh and by the way when are you coming to ride the superjet again? Oh good Peter...I sure hope you're right. I've been having these ninja-haunted day dreams all day. It's totally distracting. What a relief! Introducing The Dustin and Stacey Show!